Longboards have become a very popular form of skateboard in recent years and provide several benefits over traditional skateboards. The longer design is ideal for transporting and getting to and from locations and the larger wheel design provides additional stability. Unlike other forms of transportation and recreation, longboards do not have to be locked up and can be carried around when not being used. Perfect for downhill cruising and racing others, the longboard has allowed skateboarding to reach a different audience who initially considered skateboarding only for those able to go fast and perform tricks. One longboard on the market right now, the Atom Kicktail Longboard, is earning positive reviews and catching the eye of many who love Atom longboards. Atom Longboards is an established – and perhaps the best known – manufacturer of longboards and has earned a reputation for creating quality products. Started in 1993 by their parent company MBS, the product line has continued to grow and now includes longboards, carveboards and skateboards. This particular longboard is a perfect entry-level board and provides an excellent experience for beginners and longboard lovers alike at a great price – $79.95. Let’s discuss the pros, cons and general specifications of the board in order to get a better picture of how well it performs. The trucks on the Atom Kicktail Longboard provide excellent steering and maneuverability. Ideal for people entering into longboarding for the first time, many people who have used this product have found themselves carving down hills within 15 minutes! The standard polyurethane wheels are suited for multiple types of pavement and perform well on sidewalks, asphalt and paved driveways. With tightened trucks, it lives up to the expectations of many Atom longboards by being very fast. The graphics and maple laminate provide the board with an aesthetic quality that can be appreciated when considering the low price of the longboard. With any discount longboard, there are bound to be some downsides as well. The grip tape is not of the best quality and has been prone to wearing down prematurely. The trucks are also only adequate when it comes to quality and any long-term rider of this longboard should consider a replacement sooner rather than later. For those considering a basic investment in a skateboard, the Atom Kicktail Longboard makes a decent selection. As with any lower-priced board, ultimately the basic parts (wheels, bearings, trucks) will need to be upgraded but do not initially impact performance. This is a fast board with great maneuverability and the quality of the deck is outstanding. 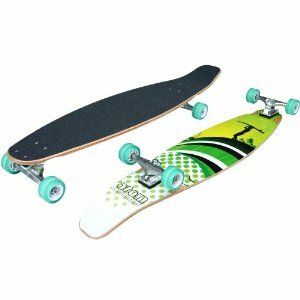 This is a great, affordable solution especially when you consider that it is one of the awesome Atom longboards range. The Atom Kicktail Longboard is highly recommended for those new to skateboarding or a city commuter who is looking to go from point A to point B in a flash. This entry was posted in Atom, Reviews, Skateboarding, Skateboards and tagged Atom, Kicktail, Longboard. Bookmark the permalink.